Here are the full original texts of 150 of the best-loved hymns in the English language, from the time of the Early Church to the late 20th century. Each is accompanied by a fascinating commentary, giving biographical details of the author, such as the Calvinist creator of `Rock of Ages' who once calculated that the average human sins 2,522,880,000 times; notes on the circumstances in which the hymn was written and how it has been used; and variant versions including the parodies of `The Church's One Foundation' and `What a friend we have in Jesus' sung by British soldiers in the trenches of Flanders in the First World War. This book should greatly assist all those responsible for choosing hymns in churches and places of worship, provide rich resources for bedside reading and meditation and provide useful background material for the millions who watch Songs of Praise on television every Sunday evening. Ian Bradley's commentaries combine wit, elegance and charm with a scholar's erudition and expert knowledge. He has enjoyed singing hymns and playing them on the piano for as long as he can remember. He attributes the origin of this enthusiasm to his father's enthusiasm for revivalist hymns and choruses and his own exposure as a boy to thundering hymns in the chapel of Tonbridge School. Among his other enthusiasms are Gilbert and Sullivan, European spas, hill walking and tennis. Here are the full original texts of 150 of the best loved hymns in the English language. Each is accompanied by a fascinating commentary, giving biographical details of the author (such as the Calvinist creator of Rock of Ages who once calculated that the average human sins 2,522,880,000 times); notes on the circumstances in which the hymn was written; and variant versions. Each hymn is prefaced by an urbanely written and agreeably subjective commentary with a wealth of anecdotes and a few ribald parodies. This charming book should also be required reading for all those responsible for choosing hymns in church. Ian Bradley writes with wit, elegance and charm and is quite exceptionally knowledgeable about his subject. 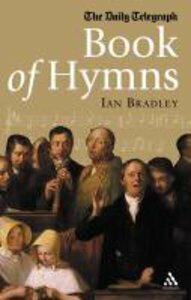 About "The Daily Telegraph Book of Hymns"
Ian Bradley (D.Phil., University of Oxford) is Reader in Church History and Practical Theology at the University of St Andrews. A regular broadcaster and journalist, he has written over 30 books, including The Call To Seriousness, Enlightened Entrepreneurs, Abide With Me, The Penguin Book of Hymns, God is Green and The Celtic Way. He teaches and publishes in the areas of contemporary British Christianity, Celtic Christianity, worship, hymnody, religion and popular culture and pastoral care.